Park Place, now a restaurant, is an 18th-century house, once used by the News of the World as the clubhouse for their sports ground. George Nash became a groundsman there in the 1920s and remained for over 40 years. His recollections of the house and grounds date back to 1919. The changes that had taken place in the 60-odd years that George Nash had known the house and its grounds were very great. The conversion of Park Place from a gentleman’s residence to a clubhouse and sports ground in the 1920s had necessitated quite drastic alterations, but many of the old outbuildings, like the stables and the coach house, survived until, damaged by a flying bomb, they were demolished after the war. The mid-Georgian wing of the house, once the domestic quarters, also sustained damage during the Blitz, but was repaired. 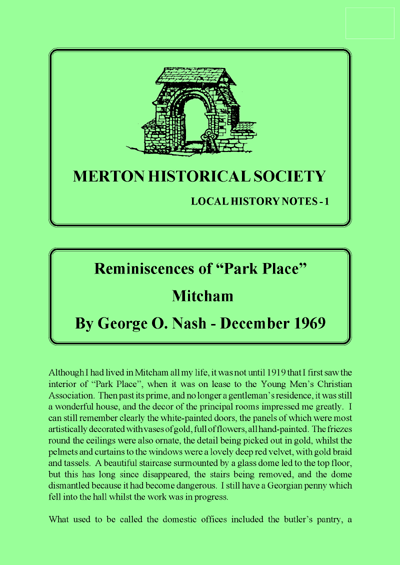 This entry was posted in Publications, Local History Notes and tagged in lhn, mitcham, modern mitcham, Reminiscences, sport, urban mitcham.